In a recent article, I talked about Paramhansa Yogananda’s first book, The Science of Religion. I explained Swami Kriyananda’s reasons for re‑writing it, and why he chose to give it a new title, God Is For Everyone. Is ecumenism the best answer? Is coexistence enough? Yogananda offered a more radical, realistic and effective solution. I told the behind-the-scenes story of the book – how God sent Yogananda to America to show people how to make their religion more scientific, by experiencing God in the “laboratory” of prayer and meditation. Yogananda hoped that The Science of Religion would serve as the foundation for his work. He wanted it to convince people that all true religions are based on the same eternal truths. He wanted to show people how to experience for themselves what God is like – that He is not a tyrant who makes impossible demands, but a God of love who offers us all of the fulfillment we have ever been seeking. “I want to give you a concept of God that will make you long to know Him,” he said. Today, there are more than three hundred separate Christian denominations in America, each with its own dogmas. In their rigidity, most of them feel that it would be too great a compromise of their beliefs to emphasize their oneness with other denominations. Everywhere today, we see religions attacking one another over their differences. At the opposite end of the spectrum, we find a handful of ecumenicals trying to create harmony between the religions by taking a little bit of each. But instead helping the religions realize their common roots, it ends up being a dilution of all religions, because the emphasis is all on outward rites and rituals. It may bring about a level of restrained tolerance, but it doesn’t help us understand that God is our common Father. To those of us who follow his teachings, it’s obvious that he didn’t mean there would be no denominations in the future. Rather, he meant that people will be concerned with knowing God for themselves. When we enter a Catholic church, a Hindu temple, a Jewish synagogue, or an Islamic mosque without affiliation but with a direct experience of Spirit in our hearts, we can look around and know that this path, too, is ours. Near our Ananda community in Mountain View, California, there’s an Orthodox synagogue. On Saturday morning we often see the Orthodox walking to their service. They’re being very strict – they won’t use machines on the Sabbath, which is why they’re walking. And the women won’t carry purses, because they aren’t supposed to do any work. 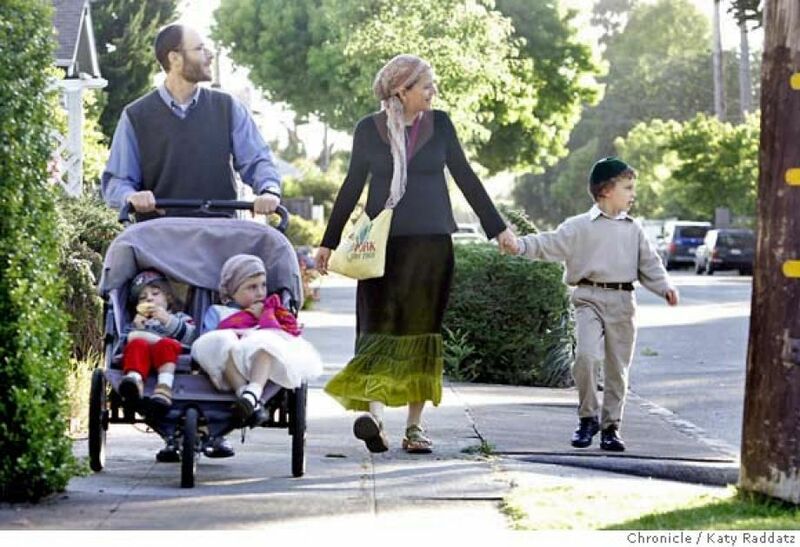 An Orthodox family walk to synagogue on the Sabbath in Berkeley, CA. They aren’t Hasidim with traditional beards and side curls. They’re ordinary Silicon Valley folks like us, but they seem a little different because they aren’t carrying anything, and they’re dressed well. Yet there’s something familiar about them that you can feel – it’s an inner bond that we share because we worship the same God. And who cares if their experience of God’s love is described in Hebrew, while ours is expressed in English, Latin, or Sanskrit? Paramhansa Yogananda pointed out that every language has a word for love. And although the words are different, the experience is the same. This is the underlying truth that unites all religions. God’s nature is unchanging – it is the same perfect love that people are seeking through every path. The problem with the superficial efforts at ecumenism is that you can’t be passionately dedicated, lest you offend someone else’s beliefs. But if you’re passionate about an actual experience that your practices are giving you, you can enjoy the other person’s passion for the divine joy and love that they’re experiencing through their practices. It’s God that you’re both focused on, and not a set of superficial dogmas and customs. I laugh when I think of our altar at home. We’ve had a steady stream of visitors from Europe recently, and they’ve left us little tokens of their affection. We have a rooster from Croatia, a bear from Russia, and a hummingbird from Italy – our little altar looks like a garage sale of all religions. The visitors came from various lands, but we were united by our common experience of God. When you visit our Ananda center in Assisi, you see the oneness of all religions standing before you. The guests come from many countries, speaking different languages, and with their own customs. It was tricky, at first, to try to harmonize the cultures, especially the Italians, Germans, and Americans, whose temperaments are very different. But we soon were able to feel that we were united in Self-realization. Because we had the same spiritual foundation, we felt as one in our souls. When you meet people who have the experience of God in their lives, it’s irrelevant how they got there. Swamiji had a tremendous regard for Rev. Richard Wurmbrand, a Rumanian Jew who converted to Christianity. (Rev. Wurmbrand died in 2001.) 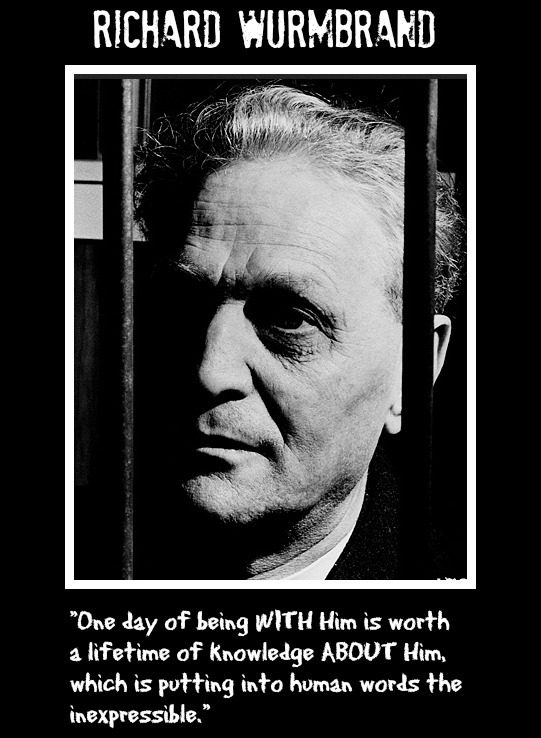 His faith was severely tested when he was imprisoned and tortured for fourteen years in by the Communists. He followed a very narrow-minded Baptist path, but he had to seek the living experience of Christ to sustain him through that terrible experience. When he came to Grass Valley, a group of thirty or forty of us from Ananda Village went to hear him speak. It was a strange experience. The leaders of the host church had their own brand of Christianity, and suddenly there we were amongst them. We were so enthusiastic for Rev. Wurmbrand, and it was baffling to the church leaders. But Rev. Wurmbrand understood us from within. He told us about his experiences in prison, and about his experiences of Christ. They were experiences that any God-realized person such as a Yogananda, or any follower of this path would immediately understand, because they were completely unrelated to shallow dogmas. He told us that God is an experience that each of us can have, and that God is firmly at our side, no matter how difficult our circumstances. He said that if we will simply turn to Him, we will find that He is with us. He told us a great deal about his inner mystical life, and it was utterly thrilling. He was a great saint, and yet if we had discussed our theologies, we would have found ourselves worlds apart. On the Ananda side of the room, none of us cared in the least about dogmas and theology. For us, it was exquisite just to be with this great devotee, because we both understood that God is one. This is the only hope for the world. It’s something that absolutely cannot be faked, because it isn’t an abstract idea about God, or a question of pious behavior. The faith and knowing of saints like Rev. Wurmbrand comes from their experience. Yogananda tells us that God is present within us. And it’s by cultivating that presence that we gradually realize that He is running the whole show of this world. We can never arrive at that understanding by holding a kind of camp meeting and declaring that we’ll henceforth be brothers. It starts with a humble experience of Spirit, and it’s only from that experience that true brotherhood can grow. We refrained, for obvious reasons – we’ve never been affiliated with Self-Realization Fellowship. But we eventually changed our name to Ananda Church of Self-Realization, because it reflects the essence of this work. It isn’t enough to have faith that God is somehow inside us. It’s necessary to have the actual experience of His presence, and then to walk in that truth and help bring that understanding to others. Swamiji often said that Ananda is the most important thing in the world today. It may seem an odd thing to say, considering the billions who are doing something else and don’t care. It isn’t that we’re important in our egos. And it isn’t even the community lifestyle that is Ananda’s main contribution to the world – although Paramhansa Yogananda predicted that this way of life would become “the basic sociological pattern of the future.” Ananda is offering people the opportunity to get for themselves what every human soul has ever been seeking. We have the solution to every problem that the world today is facing, without exception. And, much more, we have the answer to the problem that each of us must face every day, of how to find greater happiness, and avoid suffering. The oneness of all religions is found inside, in the laboratory of prayer and meditation. 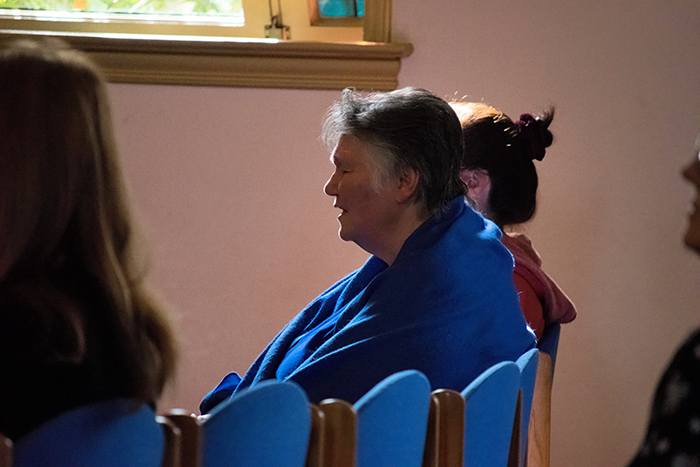 Nayaswami Anandaprem meditates in the Ananda Church of Self-Realization, Palo Alto, CA. It’s why people find it impossible to look past their fixed ideas about religion. If people could make their religion experiential and scientific, those superficial divisions would cease to matter. When we’re in tune with Spirit, we find an awareness that embraces all, and we recognize that our differences are no more meaningful than dust. When I served as Swami Kriyananda’s secretary, someone came to Ananda and tried to get us to become active in the environmental movement. Swamiji tried to be gracious, but as the man rattled on about our sacred duty to be involved in ecological politics, he grew impatient. If people lived in harmony with Spirit, they would be considerate of the natural gifts that God has given us. The single reason why people are unable to solve the world’s problems is that they’re looking for solutions outside of themselves, with their minds. It’s like patching an infected wound with a band-aid, without treating the underlying cause. The most effective way to bring harmony to the world is to create harmonious human beings. I’m not aware of the issues. But when we seek our answers outwardly, instead of by changing our own consciousness, it’s an endless battle. It’s your head-born ideas against mine, and my emotional attachments against yours. It’s only by changing our consciousness that we’re able to find true answers, and a sense of harmony with all life. Ananda has helped thousands find an inner attunement with the divine source that has all of the answers the world is seeking. The proof is that there’s a great deal of harmony in the Ananda communities. This is the solution that the world so desperately needs: small groups of people working steadfastly to attune their consciousness to the source of all love and joy, and then helping others learn to experience that awareness for themselves. Yogananda called his organization a “Church of All Religions.” But it’s important to understand that Self-realization isn’t a religion, in the sense that people have traditionally understood. The highest teachings of India don’t speak of religion, but of eternal truths – the unchanging, scientific principles that people can confirm for themselves in all ages and cultures. In the higher ages, the separate religions were known to be flowers growing on the branches of the same plant. The eternal truth comprises the scientific spiritual principles that govern all life. The term “Hinduism” was applied much later by the British, who wanted to set the ancient tradition apart from Christianity. But the great masters of all ages are neither Hindus or Christians. They follow the nonsectarian, scientific Eternal Religion. Swami Kriyananda speaks of “the path to enlightenment.” This is the path that we can follow regardless of our outward religious affiliation. By following it, we will arrive at the same realization of God that all the saints have attained. We are not a new religion. There can never be a new religion. We are a new expression of the eternal religion – an expression of a truth that is rooted in Eternity. Why Did Swami Kriyananda Rewrite Yogananda’s First Book?